Sopa de Pepino is popular and traditional Portuguese cucumber soup that is perfect for cooling down in the summer heat. 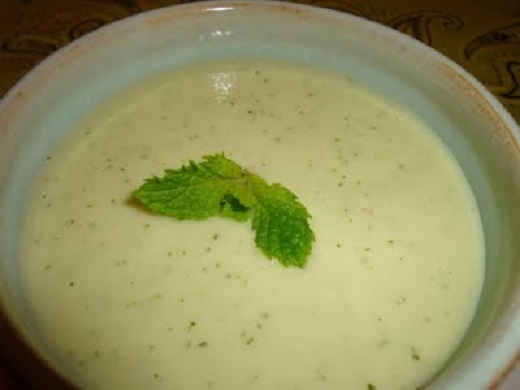 It a light green soup that is quite healthy and delicious and can be made without much fuss. It utilizes simple ingredients like cucumbers along with typical Portuguese/Mediterranean ingredients like olive oil and yogurt to create a smooth and richly flavorful soup. 1) Place the peeled and cut cucumbers, yogurt, garlic cloves, olive oil, water, and salt to taste in a food processor. 2) Blend it on high until it is smooth and consistent. Transfer to a bowl and refrigerate for 2-3 hours until well chilled. 3) Ladle the soup into bowls. Garnish with a mint leaf. Serve.